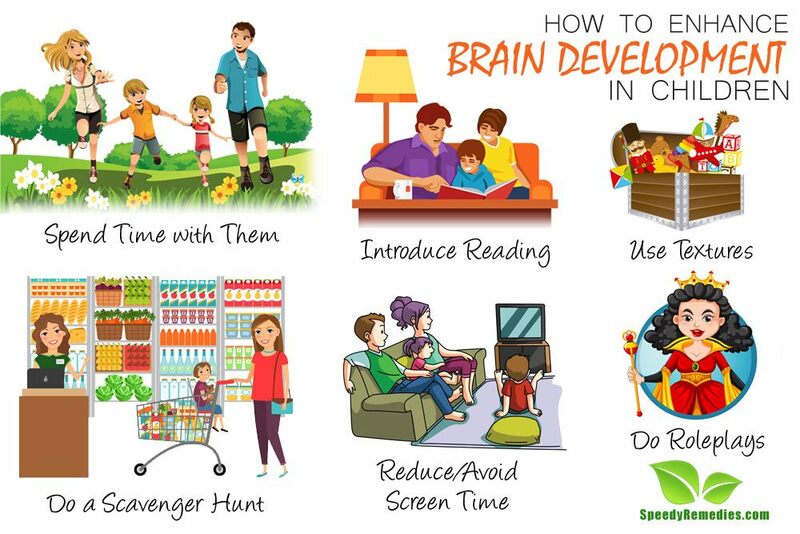 Here are some things you should do that can develop your child’s brain faster. Spending time with your children is the most beneficial thing you can do to improve your child’s learning and developing skills. Children learn language, facial expressions and emotions when spending time with their parents. Also, your touch is extremely important for them. Children who are cuddled more and touched more by their parents are more likely to lead a healthy life. This can include things like holding their hands when walking down the park or getting involved in physical play like tickling and counting on fingers. Inculcating a passion for reading is essential in ensuring that children learn to love books and gain knowledge that puts them ahead of their peers. Start reading to them even when they are too young to understand anything. This activity makes them get used to the idea of reading. They will also learn that reading helps gain new information. As they begin comprehending, start with picture books containing one image per page. These include books that teach counting, alphabets and shapes to get children used to the pattern. You can then move on the books containing pictures as well as short sentences, transitioning to books with short stories. Reading can improve the vocabulary of the child, let the imagination skills develop and allow them to communicate better using coherent sentences. Children are by nature curious. But this tendency to investigate and question everything is often repressed when parents don’t show interest or shut them up because they are tired of answering their questions. This loss of curiosity can become a hurdle later in life if the children stop questioning how and why things work. To ensure that the instinct to investigate only grows stronger, organize activities that will encourage their curious nature. One way to do so is by arranging scavenger hunts. Scavenger hunts not only encourage the instinct to investigate, they also provide children with a sense of accomplishment. Scavenger hunts can be as simple as asking the child in a grocery store to bring all the red colored items in the lane or it can be searching the books for a particular word or going through photo – albums to pinpoint a relative. Toddlers and babies explore the world around with all their senses – they see, touch, smell, taste and hear to their maximum ability. Making use of textured stuff while playing can greatly impact their sensory touch. You can use pastas or cotton balls to trace alphabets or numbers and allow toddlers to run their hands over it. This allows them to feel the shape and remember it better. It also useful to keep a box filled with different kinds of fabrics to give babies a sense of how different things feel like. According to American Academy of Pediatrics, children below 2 years should not be allowed any screen time at all as it messes with their developmental skills. There is no denying that there are a lot of educational programs and apps on television and smart phones; but for them to be effective it has to be a two way interaction. Your presence is required to guide the child when watching television programs for them to be effective. While babies and infants should absolutely be kept away from any screen time, children over 2 years of age can be allowed a maximum of 2 hours per day of screen time. This will include smart phone, video games and television. Children have vivid imaginations and love to pretend play. They dress up as their favorite princess or super – hero or act out their favorite movie stars and cartoon characters. Encouraging them in playing dress up and acting out lines isn’t just fun; it also provides them with confidence to stand on the stage and experiment with different roles. It lets them practice real- life situations and prepare a strategy on how to deal with it. For example, your child might be role playing a superhero that has to save a falling car. He or she might come up with ideas and make use of equipments to deal with that particular situation. While enhancing the development of brain is important, knowledge and intelligence alone will not equip your child to deal with the world in his or her adulthood. It is imperative that the kids develop social skills. Kids learn social skills when they interact with other kids. Playing games with rules plays an important role in teaching children the virtue of patience when waiting for their chance, the anguish of loss and how to deal with it, the joy of winning and how to interact with other people. Playing and interacting with other kids builds negotiating, sharing and self-control skills – all which come handy in future relationships. While children cannot be allowed to make all of their decisions (eating sand is definitely not a good idea! ), for brief periods of time, led the children lead and make decisions. When you are always doing things for your children, they start to feel entitled and start demanding. To inculcate a sense of responsibility and develop leadership qualities, give them a free reign. Designate small tasks to them and make them in charge of completing it. These can include things like ensuring they clean up their toys after playing or allowing them to decide what dress they would like to wear. Activities are not the only to enhance brain development; foods can help nourish the brain too. In fact, brain is the very first of the organs to absorb nutrients from the food we take. Eating junk food means your child’s brain will suffer. You need start providing them with healthy snacks right from the start so that they get used to it and at the same time their brain is able to benefit from the nutrients to develop better. Include more eggs in the diet by making egg burritos or scrambled eggs with toast in breakfast. Peanut butter is also a healthy option – you can give your children peanut butter sandwich for snacks, using whole grain bread instead of refined bread. Children are often taught that there are certain good feelings like being happy and bad feeling like being sad. This categorization can be dangerous for their emotional intelligence. Use situations when someone is upset or sad to explain to your child why they feel so and what can be done about it. Teach them to talk about how they feel. If children don’t learn a way to deal with emotions when they are young, it can severely impact how they carry themselves through life. Emotional intelligence is a necessary pre- requisite to success and therefore an important part of brain development.